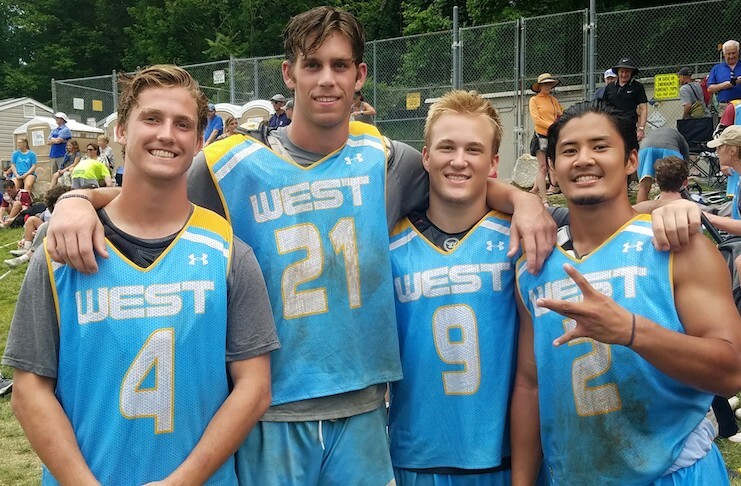 Ellis Geis’ (Foothill) overtime goal helped the Under Armour West Highlight Team defeat Baltimore and emerge from pool play as the only undefeated team in the division. The top-seed West team earned a bye in the first round of the single-elimination playoff round. They will face the winner of New Jersey-Baltimore. The West jumped out to a 6-0 lead in the first game but a gutsy Baltimore squad chipped away, closed the gap to to 6-4 by halftime, and left the game knotted 9-9 at the end of regulation. A big save by goalie Jack Schlendorf (Oregon Episcopal; 8 saves) in OT kept the West alive and Geis took advantage by burying the game winner. Other Southern Californians putting up points against Baltimore were Quentin Buchman (Santa Margarita; 2 goals), Coronado’s Nicholas DeMaio (1g, 2a), Spencer Grant (Torrey Pines; 1g), Isiah Dawson (Bishop’s; 1g), Torrey Pines’ Makail Fraboni had three saves between the pipes. A couple hours later, the West wrapped up pool play with a 9-7 win over New England. Geis and Buchman led the offense with hat tricks. DeMaio (1g, 1a) and Dawson (1a) also chipped in some points. Notes: Buchman with 10 goals is the second leading goal scorer in the event. DeMaio’s 12 assists tops the charts. The West began the event with a statement 17-4 win over Upstate New York. Southern Californians helping with offensive output included Demaio (1a), Buchman (2g), Justin Cheng (Beckman; 1a), Ryan Ramirez (Torrey Pines; 1g), and Isiah Dawson (Bishop’s; 2g). Torrey Pines’ Makail Fraboni had three saves between the pipes. This year isn’t the first time the west has beat Baltimore. Look back only one year and you’ll see.